The first thing to catch the eye of new visitors to Bobbejaanland is a massive wind turbine located in the middle of the park. While it probably can't cover all the rides on its own it likely still makes a substantial contribution. Renewable energy is a major interest of mine, and I'm delighted to see an amusement park doing its bit. Our morning began with a thirty minute exclusive session on Typhoon (#360), only the second Gerstlauer Eurofighter model to be built. These rides are currently the only coasters to feature a first drop that goes beyond vertical. This model has a very intense start, with a drop into a very tight loop. From then, however, it feels quite a bit like Colossus, insofar as its inline twists greatly limit rerideability especially for taller people. I managed four circuits before the session finished, but I'm not sure my shoulders would have taken much more even had there been more time. 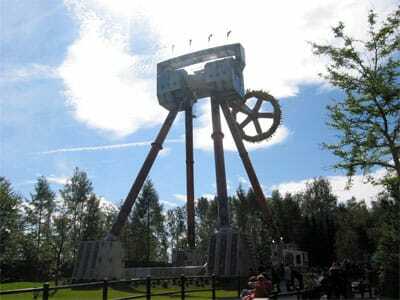 The group staged a takeover on Revolution (#361), one of the strangest coasters in the known universe. Its major feature is what can only be described as a stupidly long train, featuring thirty cars, seating a total of sixty people. Needless to say the difference between front and back seat rides is phenomenal. The length of the train is really brought home as you watch the coaster pull out at the start of a ride; the train has been moving for a good fifteen seconds (at a reasonable speed) and the back cars are still in the station. As might be expected the resulting layout is fairly simple; a spiral lift to the top, and a spiral descent back to ground level. The fully enclosed journey is accompanied by some lighting effects and thumping music. It's a simple idea, but it works - brilliantly. The long train obviously limits the scope for sudden changes of direction, but to be honest this wasn't a problem. By the bottom of the spiral the train is moving at what feels like an insane speed and the riders are pinned into their seats by the strong forces. Richard (no, not me) thought it would be a good idea to do the El Rio, the rapids ride. Getting on a rapids ride in Jeans and a Fleece, as mentioned in my last diary, is not a particularly good idea. And guess who got the wettest? 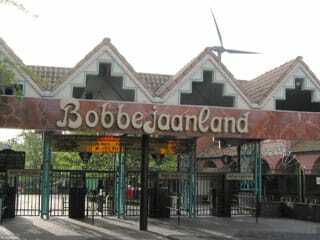 Leaving that aside, though, the rapids at Bobbejaanland is definitely one of the better of the breed. It has a substantial drop at the start (which was unfortunately not working today), and concludes with a very wet splashdown into the middle of a whirlpool. Once again though, don't ride rapids rides in jeans! Next, we tried out Speedy Bob (#362), a pair of duelling Mack wild mice. Unfortunately, only the right hand side was running. Some members did catch the left hand side, which was apparently running for about twenty minutes over lunch time, though the majority of us never got to try out the duelling aspect. Other than a particularly severe brake at the end of the ride, the ride was smooth and fun. This seems to be an issue on wild mouse rides (wild mice?) around the world. Surely it cannot be that hard to bring a mouse car to a smooth stop? Might magnetic brake fins be in order? Air Race (#363) is a very rare Vekoma Swinging Turns ride, a copy of the somewhat more successful Suspended Coaster by Arrow. The Vekoma trains are themed to look like small single propeller aircraft, though I can't imagine any aircraft owner using colour schemes like the ones seen here! At any rate, I had been told not to expect much from this, and I was quite pleasantly surprised with the strong forceful helixes during the latter half of the ride. As it turned out, we'd inadvertently saved the best for last. 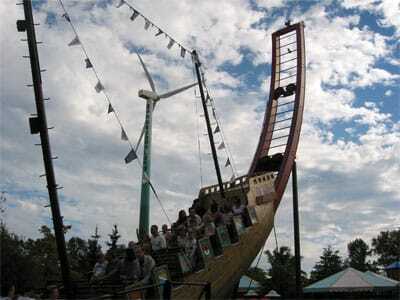 Okidoki (#364) is a superb new coaster supplied by Vekoma. It is aimed at the younger crowd, and as such it is not too high, but it has a surprisingly powerful first drop and smooth layout that all of us enjoyed. The track design appears to be a variant on what Vekoma have been using to date, and bears more than a passing resemblance to Schwarzkopf track. I wonder if this new design will be appearing on other rides; I certainly hope so. It is not every day that you come across a log flume built entirely indoors, but Indiana River is such a ride. The whole building has realistic looking plant life hanging from the ceiling, and if you let your imagination wander a little you could really be in a jungle somewhere; until you get to the scene with the epilepsy-inducing light effects. Though interesting enough these were completely out of place with the rest of the theming. It's as if two different designers took on different parts of the ride. It is an eclectic combination to say the least. I was very disappointed by the El Paso Special dark ride, a target shooting attraction marred by no scoring and a completely non-functional gun. Even those with working guns could not tell easily when they had hit a target, making the whole experience seem more than a little pointless. The animatronics themselves were quite good though; with a little renovation, this could be a good ride. Bob insisted that we should all take his photo under the Bob Express sign prior to boarding, leaving us the entire ride to contemplate possible applications of the word express to a middle aged man. At any rate, this powered coaster featured a relatively gentle layout taken at considerable speed, and the absence of severe direction changes meant that it was actually surprisingly enjoyable. By group consensus, we headed for the new Giant Frisbee ride, here named Sledgehammer. This is a somewhat larger version of the standard Huss Frisbee, with a disc that swings to 120 degrees more than one hundred feet off the ground. It was suggested that we should leave it for later, but I pointed out that we should probably do it before having our lunch break rather than after, and the group agreed with me. The ride was definitely worth doing, and highly enjoyable, but it would not have been at all fun on a full stomach. After a food break, we took the Monorail around the park to take some photos. We ended up disembarking beside the Giant Wheel, from which we took more photographs. I managed some particularly good aerial shots of some of the coasters; far better than I could get from ground level. Following this I decided to break away from the group, and headed for the Wild Waterslide log flume. It was a half an hour wait, but the queue was in shade, and it was a welcome rest. The flume itself was different; there wasn't any theming to speak of, but it did provide some different views of the rest of the park. I was determined to try out the Santa Maria pirate ship ride before leaving. This has very unusual propulsion for a pirate ship; rather than have a motor at the top swinging the ship from side to side, it instead features a track with some tire motors driving the boat, rather like a Zamperla Disk-O but without the rotating boat. The resulting movement is similar but not the same as a regular ship (as the top is not the pivot). It was certainly different; are there any of these anywhere else? At this point I met back up with a few people to do the Bobby Drop, a spinning rapids ride like the one at Hansa Park earlier this year (but nothing like as long). I heard someone saying later in the day that this version was a prototype, which seems about right; it's fun, but had a disproportionately long wait for the length of the ride. We finished up our time with three back to back circuits on Speedy Bob. At least that's what I thought we were going to be doing. When we were all sitting down, ready for our dinner, Richard announced that we had fifteen minutes exclusive time on Sledgehammer. I figured I might as well join the fun, so I was one of a handful of people who were stupid enough to do three consecutive rides without disembarking. I did feel more than a little queasy when the third cycle ended, though I recovered quickly enough. I do not think I could have managed a fourth consecutive go though! We were also given one final go on Speedy Bob - still the right hand side - which rounded off things nicely. A fantastic day was topped off with a delicious barbecue provided by the park, with just the right mix of good food and junk food. They were also selling rather good beer for €1 a pint, which as you can imagine was appreciated by all at the end of a long day.